MSN Malaysia’s BIG Party Happening This Thursday! To say thank you to all their loyal readers and followers, the guys and girls over at MSN Malaysia are throwing a BIG bash this Thursday (24th October) at Butter Factory KL! Featuring the aural talents of DJ Bento and Krista K and starting at 8pm right up to 11pm, this party is one that should not be missed. 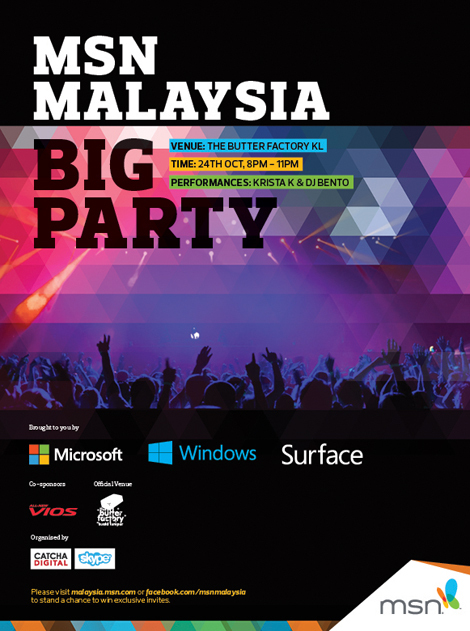 Meet the team behind MSN and have a great time at the MSN Malaysia Big Party!